Update 1 (1/18/19 @ 5:00PM CT): The KDZ file is now available for anyone with the Korean G7 model (G710N). Last month, LG shared their roadmap for Android Pie updates. The LG G7 ThinQ was listed to receive stable Android Pie in Q1 2019. Lo and behold LG is holding up their end of the bargain as the update has started rolling out in Korea. The LG G7 started receiving beta updates in Korea last November, but now the final build is ready to roll out. One of the big features of Android Pie is the new gesture navigation system and revamped Recent apps switcher. LG has included both of these features in their version of Pie. As shown in the screenshots below, swiping up on the Home button reveals the Recent apps switcher. Swiping up again brings up the app drawer, which is something that only stock OEM launchers are able to do. 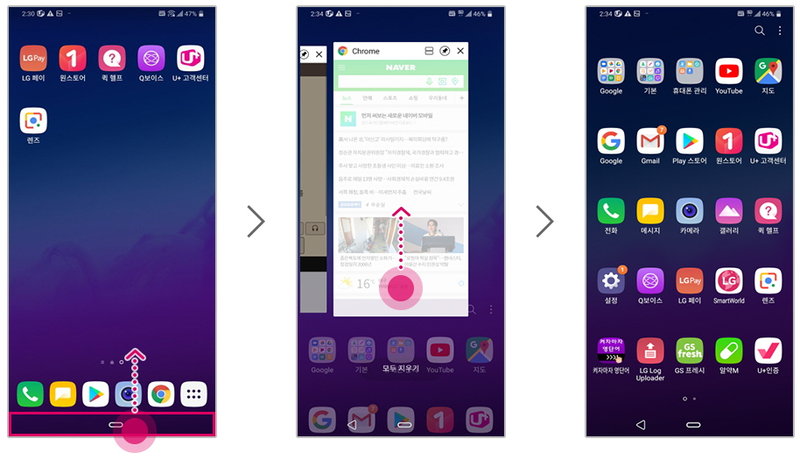 Users can also perform the left-to-right gesture on the Home button to slide between the recent apps. The fact that the LG G7 is getting Android Pie in Korea is a good sign for devices in other countries, but it doesn’t mean the update will be expanding any time soon. For comparison, LG started beta testing Android Oreo on the LG G6 five months before it arrived on Verizon. LG G7 owners in the US still may have a while to wait before they get Android Pie. When setting auto brightness, user learns the brightness control pattern and automatically sets it to the preferred brightness. If you have the LG G7 Korean model (G710N), you can download the KDZ file from this thread and flash the update manually using LG UP.